One decision can end everything … or lead to unlikely redemption. Millions watched the CBS 60 Minutes special on Jack Barsky in 2015. Now, in this fascinating memoir, the Soviet KGB agent tells his story of gut-wrenching choices, appalling betrayals, his turbulent inner world, and the secret life he lived for years without getting caught. On October 8, 1978, a Canadian national by the name of William Dyson stepped off a plane at O’Hare International Airport and proceeded toward customs and immigration. Two days later, William Dyson ceased to exist. The identity was a KGB forgery, used to get one of their own―a young, ambitious East German agent―into the United States. The plan succeeded, and the spy’s new identity was born: Jack Barsky. He would work undercover for the next decade, carrying out secret operations during the Cold War years—until a surprising shift in his allegiance challenged everything he thought he believed. Deep Undercover reveals the secret life of this man without a country and tells the story no one ever expected him to tell. One decision can end everything … or lead to unlikely redemption. The identity was a KGB forgery, used to get one of their own―a young, ambitious East German agent―into the United States. The plan succeeded, and the spy’s new identity was born: Jack Barsky. He would work undercover for the next decade, carrying out secret operations during the Cold War years—until a surprising shift in his allegiance challenged everything he thought he believed. 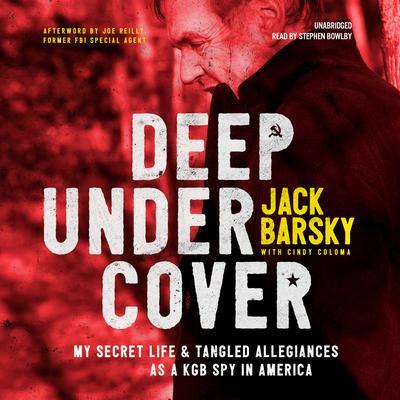 Jack Barsky was recruited by the KGB and spent ten years as an undercover agent in the United States. He severed his relations with the KGB in 1988 and had a corporate career in information technology. He was captured by the FBI in 1997. In 2015, 60 Minutes ran a story on his life and undercover work.